*Publisher provided physical ARC in exchange for an honest review. My So-Called Bollywood Life certainly lived up to its title. This is a really cute, light, and entertaining story that you may enjoy if you're not bothered by a lot of Bollywood movie references, astrology, and prophecies, or some high school drama. In my case, I went in expecting these things from reading the blurb, but I just felt that some of the drama (especially toward the end) could have been left out. And I did have to slow down my reading pace quite often when movies and actors came up. Those things aside, I still liked the story. Winnie's character is one you could describe as passionate, not only about her culture and the incredible collection of movies she owns, but she genuinely loves the arts and already has an idea of what she wants in life. But when it comes to her romantic life, she's unsure as to whether she should trust in this prophesied destiny or make her own path based solely on her heart. She spends the majority of the story trying not to completely dwell on this prediction, and while I strongly feel that we all make our destiny in life and shouldn't rely on astrology, you can't tell people to disregard their beliefs no matter how you feel about it. Winnie's friends encouraged her to trust in her feelings and not consider the prophecy too much, and even though she tried, in the end, she just couldn't rid herself of something she believed in since she was a child. What I like most about the story is how celebrated the Indian culture is within this community and the different types of food mentioned. Some are familiar to me and some new. Either way, it made me drool whenever Winnie and her family ate together. Her parents were interesting characters in their own way too, and it was enlightening seeing how they were with Winnie and how much they valued their culture and traditions. I also like Dev and the fact that Winnie didn't linger on Raj. She stuck to her decision to staying apart and she never went back on that. Loved that she gave things a shot with Dev and encouraged him to take things slow with her. It irked me at times whenever she brought up the prophecy around him, but again, her feelings were understandable because it's her belief. And even though I'd already figured out that part long before it came up, I still would have liked for Dev to be honest from the get-go, especially knowing who Winnie was and how she spent her whole life thinking about the Pandit's prediction. Then again, I could understand his reasons behind it. Overall, I like the writing, the characters, and how light and easy the story is. Again, not a fan of the bit of drama that happened toward the end, but it still made for an entertaining read. 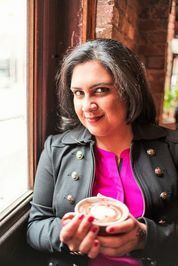 Nisha Sharma grew up on Bollywood movies, eighties classics, and romance novels, so it comes as no surprise that her first novel, My So-Called Bollywood Life, features all three. Nisha credits her father for her multiple graduate degrees, and her mother for her love of Shah Rukh Khan and Jane Austen. She lives in Pennsylvania with her cat Lizzie Bennett and her dog Nancey Drew. This sounds like a great read, glad you enjoyed it. It was adorable. Give it a try. This book is on my hit list for May after reading quite a few positive reviews about it. I'm glad you enjoyed it, too, shane! I'm really hoping to read this book over the summer. I keep hearing good things about it so I'm glad to hear it was overall a good read for you too. It's a pretty light and cute story. Hope you enjoy it when you get a chance to read it.